After sprouting, we can get the young grass of the common wheat plant (Triticum aestivum): Wheatgrass. It can be taken in different ways: freshly juiced, dried or grounded into flour. People began to take wheatgrass from the 1930s, when Charles F Schnabel tried to spread this plant. In the 1940s, the popularization of wheatgrass was continued to be done by Ann Wigmore. Several books about wheatgrass were written by Wigmore because she held that this food could cure her cancer. Chlorophyll, the basis of all plant life, accounts for 70% of the content of wheatgrass, which may be known as the most health promoting nutrient. It is proved that chlorophyll can prevent the growth and development of unfriendly bacteria by scientists. There are 20 amino acids, several hundred different enzymes in wheatgrass which could not be found in other foods, and 90 out of 102 possible minerals, vitamins and other important nutrients. If you want to be on diet, do sports or maintain a healthy immune system, wheatgrass is a great choice. Consumers can take average dosage of wheatgrass by 3.5 grams (flour or tablets). The fresh squeezed 30ml shot once every day is also suggested by some people. And if you want to get more therapeutic benefits, some even recommend taking a higher dose up to 2�C4 oz. 1-3 times per day on an empty stomach and before meals. Some users may increase their intake to 3�C4 times per day for detoxification. However, if you have a poor diet, be careful to take it, because it may cause nausea on high dosages of wheatgrass. 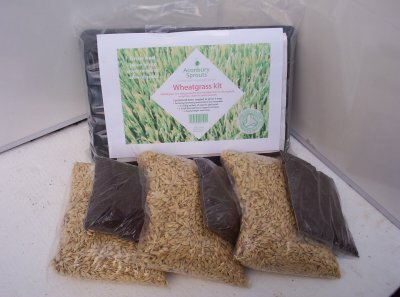 In the "bread basket" regions of the US and Canada, people can collect outdoor wheatgrass for a few days each year. It takes more than 200 days of slow growth in cold temperatures for Winter wheat to get to the peak nutritional content. That plant is only 7 to 10 inches high even after that long of time.